Giardia duodenalis, one of the most common intestinal protozoa, infects a wide range of vertebrates, including humans and animals. In this study, 84 Giardia duodenalis positive stool samples were collected from 3580 patients attending the Imam Ali Hospital and two public health centers in Andimeshk County, southwestern Iran. Stool samples were examined initially by microscopy, and then G. duodenalis was confirmed by SSU rRNA gene and genotypes were determined by amplification of the gdh and β-giardin genes. The SSU rRNA, gdh, and β-giardin genes were successfully amplified in 89.3%, 58.3%, and 51.2% samples, respectively. Of the positive samples for gdh and β-giardin, 40 isolates were successfully sequenced. Twenty-three isolates belonged to assemblage A, sub-assemblage AII, and 17 belonged to assemblage B. Of the 24 successfully amplified asymptomatic cases, 12 belonged to assemblage A and 12 belonged to assemblage B. The current study found that 64.3% of the patients were asymptomatic. 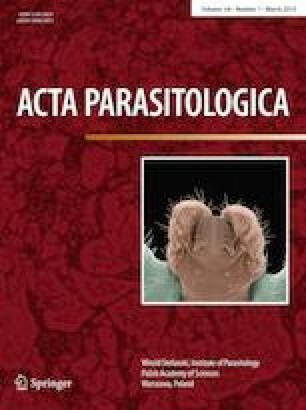 From an epidemiological point of view, the high percentage of asymptomatic patients is important because of their role in the transmission of Giardia. The predominant assemblage was assemblage A, sub-assemblage AII. In general, therefore, it seems that most infections are probably transmitted by anthroponotic pathways in the region. This project was the M.Sc. thesis of E. Mirrezaei. The authors are grateful to all patients who participated in the study. MB conceived and designed the experiments; EM performed the experiments; MB and AT analyzed the data; EM, MT, and SM contributed reagents/materials/analysis tools; MB and EM wrote the paper. The project was supported by Infectious and Tropical Diseases Research Center, Health Research Institute, Ahvaz Jundishapur University of Medical Sciences, Ahvaz, Iran (Grant No. OG/94167).